Cross-posted from the Sacramento Bee for educational purposes. WASHINGTON – The federal government should do large-scale drug injections of wild horses to make them infertile, according to a highly anticipated recommendation from the National Academy of Sciences. The report released Wednesday said the Interior Department’s strategy for wild horses is making a bad situation worse. The government has rounded up nearly 50,000 wild horses and put them in corrals and pastures. More of America’s wild horses are now in holding facilities than estimated to be roaming the wild, in what the National Academy of Sciences called a failure to limit the animals’ fast-growing numbers. The Interior Department’s Bureau of Land Management requested the report amid frustration and skyrocketing costs of the wild horse and burro program. The annual cost to taxpayers of the program has nearly doubled in four years to $75 million, with more than half going to costs of holding facilities. The BLM says roundups and holding facilities are needed because swelling horse populations are too much for the wild range to sustain. Wild horse advocates say the issue is really about favoring the interests of ranchers whose cattle and sheep graze upon the public lands. The National Academy of Sciences said a big problem is that the Bureau of Land Management doesn’t really know how many wild horses and burros there are in America, or their true impact on the rangelands. The report concluded that BLM is likely underestimating the number of wild horses in America and that their populations are growing by as much as 20 percent a year. The independent panel of scientists that wrote the report said the agency needs a more defensible scientific backup for its decisions on wild horses, including consideration of the impact of livestock on the range. “The science can be markedly improved,” said Guy Palmer, a Washington State University professor who led the panel. The government’s roundups of wild horses are just making the population problem worse, according to the report. Shutting tens of thousands of horses in holding facilities means less competition for food and water on the range and more population growth, it concluded. Leaving the horses alone to roam the range would lead to a competition among them for food and water that would meet the goal of cutting their numbers, according to the report. But “having many horses in poor condition, and having horses die of starvation on the range are not acceptable to a sizable proportion of the public,” the authors concluded. The best alternative is a widespread use of fertility control measures, the independent scientific panel decided. 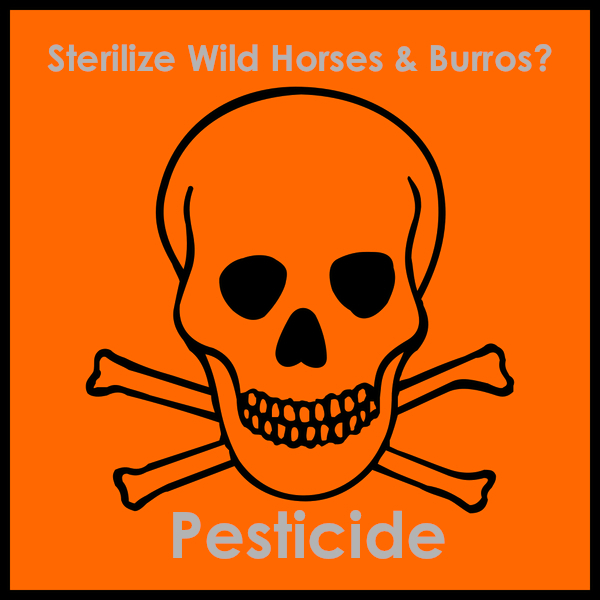 They recommended chemical vasectomies for stallions and the injection of the contraceptive vaccines GonaCon and porcine zona pellucida for mares. In contrast, Karen Sussman of the International Society for the Protection of Mustangs and Burros has been studying herds in her care for 13 years. The results show healthy social structures of wild horses control population. ISPMB’s president, Karen Sussman, who has monitored and studied ISPMB’s four wild herds all these years explains, “We would ascertain from our data that due to BLM’s constant roundups causing the continual disruption of the very intricate social structures of the harem bands has allowed younger stallions to take over losing the mentorship of the older wiser stallions. It’s time for a moratorium for scientific studies like Sussman’s. We need to help the wild horses and burros not harm them. Let us use science to guide us.